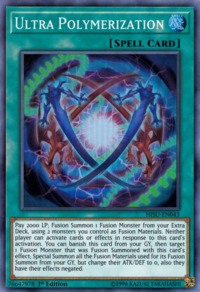 Pay 2000 LP; Fusion Summon 1 Fusion Monster from your Extra Deck, using 2 monsters you control as Fusion Materials. Neither player can activate cards or effects in response to this card's activation. You can banish this card from your GY, then target 1 Fusion Monster that was Fusion Summoned with this card's effect; Special Summon all the Fusion Materials used for its Fusion Summon from your GY, but change their ATK/DEF to 0, also they have their effects negated. This card's artwork contain the swirly background from Polymerization, along with an energy orb with the two Fusion Materials posed in orbits similar to anime's depiction of Xyz Materials. The green rings present in the anime's depiction of a Synchro Summon can also be seen surrounding this orb. This is in reference to its anime effect, which allowed the user to Synchro Summon or Xyz Summon using the Special Summoned Materials by either changing both monsters' Levels to 4 or treating one of them as a Tuner monster. Despite the fact this card was used with Starving Venom Fusion Dragon in the anime, it's not possible to use this card's second effect with it in the OCG. This is due to the fact that, in the anime, Starving Venom doesn't require its Materials to be on the field, while its real-world counterpart does. The Japanese name of this card is a pun on the name of Super Polymerization. Super Polymerization is named in Japanese as Chō Yūgō while Ultra Polymerization is Chōetsu Yūgō. Their chain of evolution features the fact that each member holds an advantage over the others. Polymerization allows Fusion Materials to be used from the hand. Super Polymerization allows an opponent's monster to be used. This card Fusion Summons without losing its Fusion Materials.